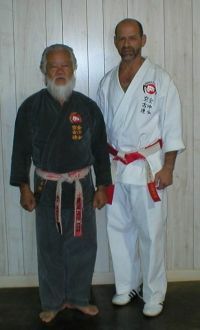 Sensei Ader began training in June 1970 under Alfred Gossett in Goshin Do Karate and Jiu Jitsu. After 20 years of study Sensei Ader was promoted to 5th Dan in June of 1990, shortly before converting to Kenshin Kan. In August of 1990 Sensei Ader began studying with Kise Hanshi and in July of 1994 he was promoted to 5th Dan in Kenshin Kan Karate and Kobudo. On September 17,1995 Sensei Ader was appointed an International Police Self-Defense Instructor and was promoted to 5th Dan in Tuite. Sensei Ader was promoted to 6th Dan Shihan on June 9th, 1996 and was also appointed one of the three US directors at that time along with Sensei Greg Lazarus and Sensei John Shipes. Shihan Ader was promoted to 7th Dan Kyoshi by Master Kise in June of 2001 and continues in his role as director while keeping a strenuous teaching, research and seminar schedule.